The Aberdeen team involved in the project studied six mountain summits in Perthshire to investigate how vegetation on mountain summits is changing as a result of global warming. Francesca Jaroszynska, who was studying at the University at the time of the project, followed in the footsteps of Peter Ewing, a field botanist who carried out surveys of the same mountain areas a century ago. Francesca found that plant life on these mountain summits has changed significantly and that while many of the characteristic alpine species that were previously recorded are still present, there has been a huge increase in species that previously only grew lower down on mountains where conditions were less harsh. Alpine areas harbour high biodiversity, but are affected by climate. In response to global warming, the altitudinal limits of species are shifting upwards. This upward shift of “generalist” plant species (such as grasses) into alpine zones is likely to replace specialist alpine species (such as herbs and dwarf shrubs) in future. Francesca’s findings were included with data from 300 mountain summits across Europe which together showed that, just as the rate of climate change is speeding up, so the rate of change in mountain summit vegetation is accelerating. 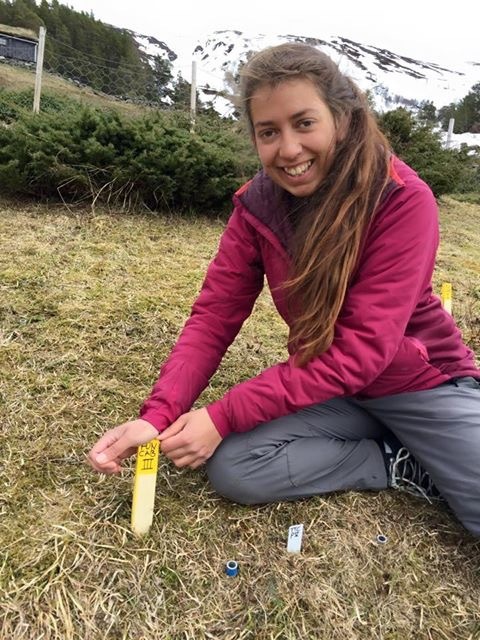 Francesca, who is now studying for her PhD at the University of Bergen, said: “This European-wide project has made very exciting and revealing inroads into our understanding of the response of alpine plants to climate change. Revisiting mountains that were walked and loved by Ewing one hundred years earlier was like travelling back in time – the mountain summits may still be there, but what grows and lives on them is very transient and vulnerable to climate change. The approach of combining history and ecology to tackle one of the most pressing questions in ecology today is unique, and it is gratifying that Scotland, and Aberdeen University, has been able to contribute. As a bachelor student when I conducted the fieldwork in 2013, it is very exciting to see my work playing a role in painting a picture of the European-wide increase in plant species on mountain summits as a result of climate warming. Dr Sarah Woodin, from the University of Aberdeen’s School of Biological Sciences, commented: “This was a great project to be involved in, and gave Francesca a fantastic opportunity to carry out exciting field work, whilst contributing to an international collaboration.